The winter break from school is often filled with travel plans and activities, but it is important to keep your elementary-age child learning over these weeks. Because kids also need a break from school and a chance to play, the best educational activities are ones where kids don’t realize they are learning. Bring on the holiday homework! Cook up an easy lesson. Invite your child into the kitchen to help you whip up a special dish — from Christmas cookies to potato latkes. Having your child help you with a recipe involved reading, writing and measuring. As your child to help write up your shopping list before you hit the store. Once you start cooking, have your child read the recipe aloud. As you cook, talk about measurements and temperatures with your child. Write thank you notes. Writing notes of appreciation to gift-givers teaches gratitude and helps practice writing and spelling skills. Make sure to drink a cup of hot cocoa to make this task feel more festive. Make the most of car rides. Turn the drive to or from a holiday get-together into an opportunity to practice letter and numbers. You can look for license plates from different states, try to find the alphabet on the license plates or even count the number of red (or white, blue or green) cars you see. Try making this game even more meaningful by having your child graph the results and draw a conclusion about their observations. Maintain reasonable bedtimes. With no school to get up for in the morning, it can be tempting to let kids become night owls. A few days before school starts up, ease back into the regular bedtime schedule so your child can start the near year bright-eyed! Ask for grocery list help. Have your child help choose what to buy, how much you need, check your supplies to see what you have already, write the list and sort coupons. Try posing math-related problems. For example, say you need two eggs for one recipe and three for another. Ask them to determine if you currently have enough in the fridge or need to add eggs to your list. Let kids help with online shopping. Need a last-minute gift for Grandma? Log onto your favorite shopping sites and let your child help you select presents. This helps children work on their computer and research skills. Have a family game night. Chances are, many of your family’s favorite board and card games reinforce skills such as counting, reading and drawing. Gather the group to play games you usually don’t have time for on school nights. Some to try include: Go Fish, Spoons, Cracy 8s, 500 Rummy and Hearts. Create a scrapbook of the holidays. Have your child create a scrapbook of what they did over the break and write sentences on each page about the activities. Use both picture that your child takes and pictures that you take of your child during the festivities. Pick a theme. With your child, choose a theme to explore over the break. If your child has expressed interest in outer space or dinosaurs, take this opportunity to learn more about the topic together. Check out books from the library, take a field trip, conduct science experiments and create art projects all related to the theme. 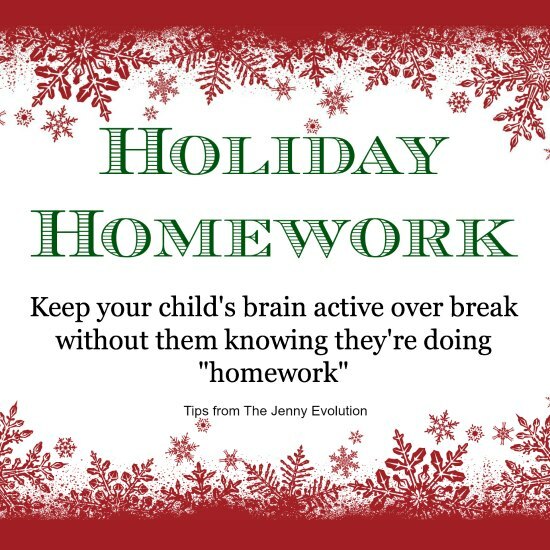 Most importantly, have fun with your child over the Winter Break and enjoy your time together! I don’t know about you but I don’t write over the holidays. My hair is on fire getting everything together so I can focus on the kids as much as possible. It’s just not realistic to get things done when the kids are home for 2 straight weeks! As a teacher, I think all of these ideas are spot on. Helping with recipes, writing a holiday break scrapbook and thank you notes will definitely keep their skills up while they are away from school. Great list! Thanks, Kirsten. 🙂 You know I’m sneaky that way! Sometimes the kids catch on but they’ll usually play along.